Steven Johnson has a bag of tools he carries when he’s working in someone else’s house. Think of them as “beaters.” There are no Japanese chisels in that bag. Even the screwdrivers, he admits, are barely worth having. The disadvantage is obvious: you don’t get to have the nice feel of a quality tool as you’re working. The advantages are just as obvious: If you lose them while you’re out, you won’t shed a tear. Also, if someone other than you uses, or abuses, them, you won’t have to create a scene, like I did once when I came home from work to find the air conditioner installers had “borrowed” one of my good chisels to dig through our home’s outside wall to run their refrigerant line. Not surprisingly, they ran into one or more nails. My 3/4″ chisel had a U-shaped divot in what had been a very sharp edge. The workers were long gone by the time I got home, but I couldn’t contain my rage. I called their boss. They called me the next day with a sincere apology. With that in mind, had someone else done with my Irwin clamp what I did one day, I would have hit the roof. that not only do owls not make their own nests, they don’t add their own bedding material, either. I had to take them down to add nest material, but I had designed it to be removable because the box would require annual cleaning. The home nest box is attached to a post in the bulkhead of our boat ramp. The location is a combination of the little open air in our yard and a place we can see from the house, as well as being beyond jumping distance for squirrels. Yes, I know the squirrels can climb the pole, but don’t tell them, because they haven’t yet. However, the location makes working a little treacherous, because I have to balance on an 11-1/2″ wide board right over the water. Taking the nest down is the reverse of installing it: apply an Irwin bar clamp at the top and bottom of the post, remove all but one of the six construction lags attaching it, lever it down carefully. Everything was going fine until I removed a clamp, set it on the deck and my toe nudged it into the Bayou. 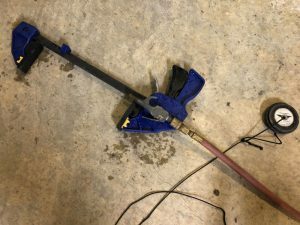 Well, I couldn’t stop what I was doing, so, when the contraption was safely on the ground I went to the house and put another clamp in harm’s way. Within 15 minutes the beautiful pine shavings were in the nest and it was back in the air. Now, to find the missing and presumed drowned clamp. I was sure it had not gone far, so I started with a garden rake, which yielded a bunch of pine needles and leaves. I fished. And I fished. And I fished some more. 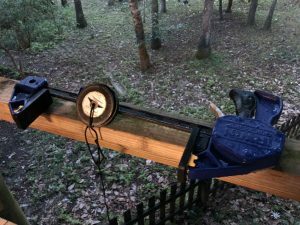 I had just about decided that I was going to strike out when, finally, I felt “clink” in the line and some extra weight when I pulled the string. My next predicament was saving the clamp from its exposure. This is good practice for any time one of your steel or iron tools becomes wet. Step One is get it clean. Dirt holds moisture, so you want all of the grime off. After a plain-water rinse, I scrubbed it really well with Dawn and a stiff brush. You’re going to re-oil it soon, but you need all of the oil off because oil holds dirt and dirt holds, well, we covered that. 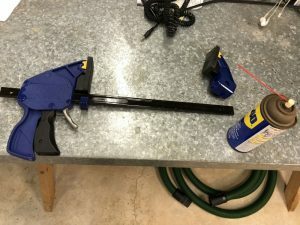 A good rinsing with a hose made the clamp (and the magnet) look pretty good. However, Dawn, a brush and some elbow grease are going to remove dirt you can’t see. Now that we’ve got the clamp good and wet, let’s get as much water off as we can. One of the first jobs I learned as a budding auto mechanic was cleaning and repacking wheel bearings. In that job, as in this, an air hose can remove a lot of water in a short amount of time. Blow and blow and blow until the clamp is dry in all its hiding places. Don’t forget your magnet. Take good care of it and it can serve you again one day. Now, let’s remove even more water. Do you know what “WD” stands for in “WD40?” Here’s a hint: It doesn’t stand for “oiling, lubrication and protection.” WD40 isn’t something you should put on a tool or item for long-term use. It contains solvents and the solvents chemically and physically drive moisture away from objects it touches. “WD” stands for “water displacement.” Its inventors made 40 formulas before they got it just right. It’s great in a situation like this, where we might not be able to completely remove all of the water from the inner workings of the handle and hidden spaces such as around the split pin. Disassemble as many parts as you can, then hose that baby. The same procedures you use to turn a clamp into a spreader can be used to partially disassemble it. I wasn’t brave enough to dismantle the squeeze mechanism. I could just see parts going BOING and never getting them back together again. WD40 loves for you to use their product like this, maximum volume! Lubricate all of the parts with a quality spray oil mixture and you’re ready for reassembly. Wipe off the excess. 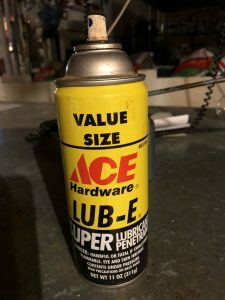 I never let myself run out of this Ace Hardware spray lube. It comes with a tube, or you can spray a big area with the nozzle.